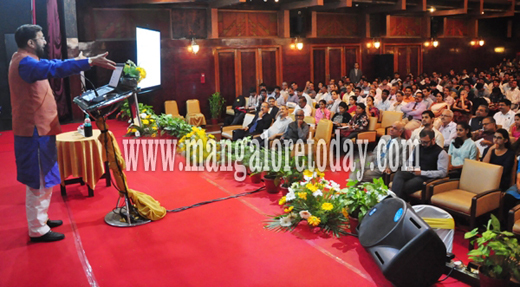 Udupi, Jan 9,2017: Speaking at the fifth All India Convention organised by Sanskrita Bharathi at Rajangana Udupi, Union Minister for Human Resource Department Prakash Javadekar said Indian languages should be promoted at all levels of education. The minister went on to say that the three-language formula for learning should offer Indian languages, instead of foreign languages like Mandarin, French, German as is widely practiced in Indian schools today. The teaching materials should be prepared in Indian languages. Asserting that Sanskrit is an important means of communication, the minister added that Sanskrit is also the language which enables the welfare of the country. Sanskrit is the base for many Indian languages and there is need to conserve and popularize Sanskrit. The minister said that conserving and supporting Indian languages is government’s top priority. He urged Sanskrita Bharathi to come up with the dictionary of Sanskrit with all other Indian languages. The Minister added that universities imparting Sanskrit education have to submit action plans formulated to teach Sanskrit language, following which the government will take action for capacity build up of Sanskrit Universities. The minister told reporters that development is the only agenda that BJP will fight for in the Assembly elections in five states. Lauding the prime minister for demonetisation, Javadekar said every decision taken by Modi aims for justice to the poor and employment is the priority. Besides, demonetisation has supported the idea of development and proved an important step to curb corruption and black money. Tough action is taken to implement the recommendations of the Supreme Court-constituted special investigation team (SIT), he said. On formulating a new education policy, the minister said that suggestions from various stakeholders are invited. A committee led by eminent educationist would review the suggestions before embarking upon the final draft notification. He said that a request by Karnataka government to provide 25% seat reservation at the Indian Institute of Technology (IIT) Dharwad for Kannadigas residing in Karnataka is rejected as no state has reservation or role in reservation. But the present situation faced by people naturally make people rage over as everything.